View all Avalon homes for sale right here. Avalon, the upscale mixed use the development near Downtown Alpharetta off of Old Milton Parkway and Georgia 400 is a masterfully planned upscale and outdoor mixed use mall and housing development that has brought the live/work/play concept to Alpharetta and quickly established itself as the shopping, dining and living experience that helped continued to transform Alpharetta into one of the most sought after areas of Metro Atlanta. Avalon is located in the City of Alpharetta in Fulton County, Georgia west of Georgia 400 on Old Milton Parkway. The entire Avalon development is approximately 86 acres of mixed-use space equipped with fiber internet service said to be as fast as anything offered in Atlanta. There are Class A office space and about 500,000 square feet of retail shopping including a Whole Foods, Regal Cinema, Ted's Montana Grill, a steakhouse and numerous boutique and high-end shopping choices. 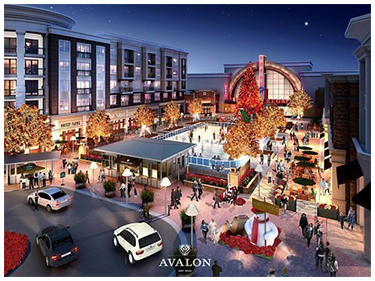 When complete, Avalon will also have a luxury hotel, live events in the square, free wifi and ice skating in the winter where the quad transforms into a rink resembling Rockefeller Square. The residential development section of Avalon consists of single-family homes and townhomes on the corner of Westside Parkway and Georgia 400. These sought-after homes and townhomes start at about $600,000 and work there way up to about $2,000,000. At the core of what Avalon brings is walkability to some of the best shopping and dining Alpharetta has to offer. You can view all homes for sale in Avalon below. Stay up to date on what's going on. You can view all of the recently sold homes in Avalon right here. Schools that serve Avalon at the time of this writing are Manning Oaks Elementary, Hopewell Middle and Alpharetta High. All of the schools are part of the Fulton County School system. Avalon has a long list of amenities including vending machines, restrooms, parking the Palmer Plaza, interactive directories and more. Below is a highlighted list of the more important amenities available. Avalon's Living Room is located in front of the movie theater and includes a fire pit, swings, bocce court and water fountain. Hang out with friends in the summer and test your skills. The play area is located next to the movie theater and includes indoor and outdoor sections for children 6 and under. Take a break and hang out by the bocce court and do some people watching at the fire pit. The dog park is located near the residential section of Avalon and there are dog clean up bags located throughout the community. Avalon has 16 charging stations throughout the parking areas and Whole Foods has 2 additional charging stations. Avalon is equipped with free fiber wifi throughout the entire community with gigabit Internet service. This is a large play area in front of the movie theater. It's also where the ice skating rink is in winter. During the warmer months, you might see a yoga class or a concert or people hanging out like they would in a park or for other community events. Valet service is located in 2 locations. One is at the top of the plaza and the other is Oak Steakhouse. If you are a homeowner and would like to sell your home in Avalon, Premier Atlanta Real Estate can help. Contact us to schedule a meeting and find out how our marketing plan is different and can help you sell your home for the most money in the least amount of time. We are experts in Alpharetta Real Estate and we can help you sell your home for the highest price in the least amount of time.